Julian Ray is a Toronto Canada based musician I have had the pleasure of meeting right when Canada was hosting the XXI Olympic Winter Games. His freestyle New Age Ambient and Meditative discography meets and exceeds our gold standard for providing our readers defining music and I will soon be writing more about him. 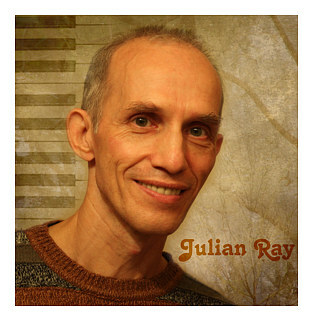 Julian Ray’s presence in the music industry is lengthy in duration and he is a current member with the Society of Composers, Authors, and Music Publishers of Canada ( SOCAN ) and an independent solo artist who produces all of his music in his project studio suite. His current releases are Seashell Stories, Saga, Wonderful Life & In Flow of Light release that I had published a review about recently on our main pages. Always looking ahead, 2 ready for release are Argonauts of Kosmos & Garden of Mysterious Souls. Starry Tale, Evolution & Path To The Moon are future projects with song samples available at his julianraymusic.com website. Julian’s educational background and interests are well centered in music, psychology, theater, philosophy, and art, plus he is a design artist along with wife Katrin Ray, who plays an important role by album art design and her assistance with helping advance Julian’s musical career to the next level. Their design work together as a couple has been greatly recognized by many prestigious awards in Europe and North America during numerous design exhibitions around the world. In Flow of Light is his current release with a lighter form of easy listening ambient music affable for at home or on the go relaxation with keyboard and percussion effects that nicely reinforce the trademark easy to recognize discography of Julian Ray. Silence is one song from In Flow of Light that gives a measurable indication of Julian’s characteristic approach since this particular song has more of an atmospheric casual feel that makes traveling or relaxing at home even more enjoyable. 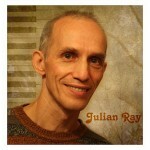 Visit julianraymusic.com and read his biography page. Be sure to take a look at his current albums page, his future projects page then our page dedicated to Julian. The album quote from my review titled New Age Music Canadian Style, and the atmospheric song video Silence are shown below to give you an example of Julian Ray’s individual freestyle approach to music that indeed makes the winner’s circle. Julian’s current album In Flow Of Light has a casual ambiance while hosting the 10 uplifting song melodies in a relaxing format, great for travel or winding down right at home. His prior releases Saga, Wonderful Life & Seashell Stories maintain this relaxing and uplifting concept, with all having a noticeable individualistic feel that indirectly tells you it was produced by Julian Ray.